For over twenty plus years, Chicago Magician Jaime Aponte of J-Magic Entertainment has enjoyed learning magic and entertaining audiences of all ages with Amazing Magic, Comedy, Illusion, and Astonishing Sleight-of-Hand. Born and raised in Chicago, IL, he began learning magic at the young age of eight. Magic is an art that requires patience, constant studying and practice. Magician Jaime Aponte also enjoys teaching and encouraging children in this wonderful art we call magic. He teaches children at Harper College during the summer the history of Magic, magical concepts, performance technique and of course they learn a great amount of Magic Tricks, he also has lectured at Magic Clubs to other professional magicians about the Business of Magic. Today, Magician Jaime Aponte is a household name entertaining thousands of children and adults and performs about 200 Magic Shows every year for all types of events from Birthdays, Boys & Girls Scouts Events, Bar/Bat Mitzvah, Block Party, Park District Events, Corporate Events, Daycares, School Functions, and Weddings. Each performance features an exceptional blend of magic and comedy customized to the event, using sleight-of-hand magic, unique illusions props, comedy, and live animals from Beautiful Doves, Adorable Bunny and even Large Trained Boa Constrictor Snake Illusion are available by request. Magician Jaime Aponte is an expert entertainer. He has also performed amazing 'walk around,' close up magic at many family dining restaurants such as The RAM Restaurants, Home Run Inn Pizzeria, Giordano's Pizzeria and The Bennigans Restaurant. Jaime says "The best part about performing at the tables is that the magic happens right there in the hands of the guest and also I love to make people laugh, but it really holds a place in my heart when children laugh!" In addition, Magician Jaime Aponte has been featured in newspapers and has volunteered performances for children with special needs and care through organizations like the Starlight Starbright Children's Foundation. The smile and laughter of these children is a reward, which makes him glad to be entertainer. 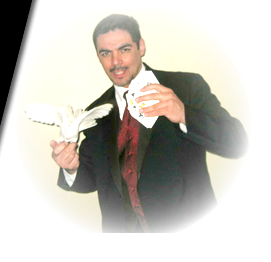 Magician Jaime Aponte is a member of the legendary Wizards Club of Chicago, Aces Magic Club and the Conjuror's Corner Club.